I had originally planned to ride Huntington with a buddy yesterday morning but those plans fell through when he came up short on the time needed. At first, I wasn't going to ride because of the weather but I was jonesin for some hammer time, or I should say my legs were. Now that I am riding three to five times a week, my body wants more and more, or maybe it's the mind, I don't know. What I do know is that if I don't ride, I have to do something, and the only time I had for this weekend was right now. I was supposed to ride to work Friday morning but Nor'easter dumping rain on Southern CT didn't seem like a wise move. I think this means that I am still a fair weather commuter. I want to try riding in the rain, it's just a question at this point of how much rain is safe to ride in? Pouring cats and dogs with leaves on the road which could make for very slippery conditons or light rain. I think from a risk management perspective the latter is the safest bet. On Friday, to make up for the lack or riding, I pushed myself at the gym. At 8 am on Saturday I decided to go for it because with all the weekend activities I wasn't entirely sure whether I would get out at all the rest of the weekend. The Qball was calling me. I had 398 miles on the bike and it was asking to go over 400. I broke the 400 mark with the fixation last week but half of those miles are rode miles but the Qball is all trails. In fact, the 'Horse has over 200 trail miles on it! The Brody Forest Road of the trail, as you can see in the photo below, was covered with a very wet plethora of sugar maple leaves. It's funny how every fall, they are the first to go yet there is a such a mix of other trees that don't turn so quickly that you hardly notice them. 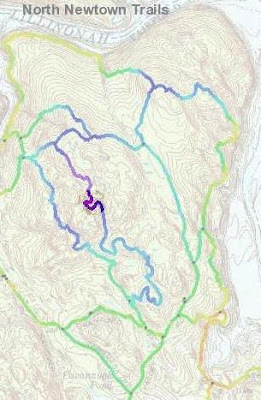 My main concern, however, is whether I would be able to climb the entire fire road to the Gussy Trail head. I did stall out the last time I tried it and these conditions seemed like a precursor for immenint failure. Here I am at the intersection with west side blue trail and the Brody looking all chipper and barely winded. The Jalopy climp was a walk in the park, even with the wet conditions. You will notice that I am wearing orange but that was a mistake because it was probably boardering 70* F and the humidity was hovering around 80%. Conditions were not what I would call Indian Summer, rather Rainforest revisited. At this point I could feal the heavy cotton hunting shirt already weighing me down with sweat. I did, however, clean all the climbs on this portion of the trail! In fact, the 34:20 ratio feels a little tougher but not by much. On the Gussy, it was the same way I was hitting most of the ups with plenty of power left over. I still need a good metaphor to describe the area in which the trail runs down the side of a flatish, twisting gully and then a quick downhill flight onto the original old logging road. This section starts after you hit that little roller and then you start working your way down hill along the edge of the vale. Below is the area that I am talking about. It kind of reminds me of a baby's boot or a horse stirrup. Now that might work, after all the Gussy trail is also a horse trail, this section could be called the Stirrup. Now there is Fall as in the change in seaons evidenced by all the leaves coming down on the trail and then there is fall, as in the pull of gravity whereby my body goes over-the-bars, with the bike following because I didn't get my other foot out of the clips in time because on this particular up-and-over the rocks on the landing tread were displaced which created a gap that was perfect to stop my tire dead. That was fun! I had thought about not wearing the knee guards but decided to do so any way. Good thing. Just got a little dirty from the fall. No injuries thankfully. I did, however, go back and correct the problem making it better than I think it initially was. Did a little work at Via Roma when I found the south end of the armoring in need of some more work. Added a few more rocks cover some of the muddy area. One thing I think that will be necessary sooner, rather than later is some benching is needed on the eastern section of the trail after the third stream crossing. Not pictured but after riding through here a few times with all the rain that we have had, it's just way to soft. Probably a good thing that I was wearing blaze orange and had my bells on this morning because if the owner of this truck was lurking around the Gussy trail, I never saw him.